Notice if your child is acting out of boredom or tiredness, and help to address these feelings first. Figure out if your child just wants your attention. Take a few minutes to stop and give your child some one-on-one time. 3. If your child really seems to be hungry, offer a part of the next meal or a choice of fruit or vegetable as a snack. Even with structured meal times, there may be times when you need to be flexible. You are the best judge. I tell my son that he can have carrots or celery if he asks before dinner. If he refuses, then I know he might not be really hungry. As a mom, I would be fine with offering him that option if it’s warranted. Please see my other posts for the previous Meal Wars series. And don’t forget your responsibilities and your child’s when meal time comes. It takes preactice just like anything else we do. This entry was posted in Child Nutrition, Nutrition and tagged attention, boredom, child, hungry, meals, snacks. Bookmark the permalink. One technique I really like for school aged kids is to get a plastic container (clear plastic shoe containers work great) and fill it with a days servings of fruit and veggies, like apple slices, cucumber, or whatever healthy fair the child likes. When they ask for a snack they know they can have whatever is in the box. 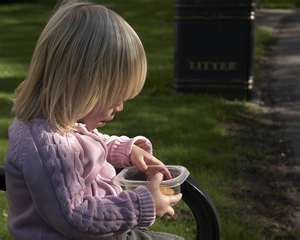 The child practices making choices for themselves from a set of positive choices, mom and dad don’t have to constantly suggest what to eat, and everyone understands whatever is in that box is an OK anytime snack.